Lift and Shift UK offer a wide range of stair climbers for sale. Call Today and let us help you make the right choice. Call 01285 741 150 for a quote today. We also offer delivery and training services! The Tiller is a worldwide patented mobile lifting tool. As maneuverable as a hand truck. Ultra light steering; easy to balance. The Tiller lifts a maximum of 75kg to a height of 1.10 meters. 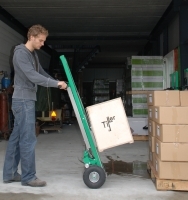 The Tiller can be used in many situations, in small spaces and it is easy to transport in a van. Lifts itself into the van and onto platforms. Prevents health and safety fines from physical stress. The Stairking is a magnesium, electrical stair walker. Battery driven 0.5pk, 50 amp slowing motor for 80% more load capacity. lndustrial quality with constant transmission. Large 2" PU-foot lever for better grip on stairs. The automatic rewind ratchet ensures the belts secure the load. Supplied with recharger and circuit breaker. Measurements plate 61 x 10cm.